It’s a noisy place, Westminster. Debates in the House of Commons are punctuated by lots of booing and cheering, and the Speaker sometimes sounds like an irritated teacher trying to bring some order to a class of unruly teenagers. Knowing this reality, it’s hard to imagine a group of MPs, from different parties, sitting together in silence and meditating. 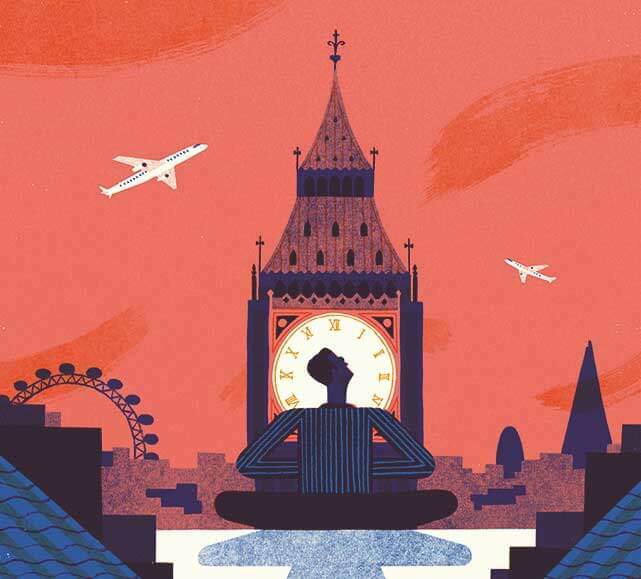 But mindfulness, the meditative technique embraced by celebrities (Oprah, Goldie Hawn) and corporations (Google, Target, Goldman Sachs), is now being enthusiastically embraced in the Mother of Parliaments. And before long – at least if Chris Ruane has his way – by legislatures around the world. Duane, who until the Conservative triumph this past May was the Labour MP representing the Welsh constituency Vale of Clwyd, has been touting the benefits of mindfulness since he first discovered the technique almost 30 years ago as a primary school teacher. Nervous when government inspectors came to visit, he took part in meditation sessions designed by the school nurse to help teachers deal with the stress. Ruane found them so helpful that he introduced various meditation and visualization techniques to his students, to help them wind down and focus. Buddhist meditation practices were new to him. “I Googled mindfulness, listened to some things off the Internet, and started practicing,” he says. It had such a profound impact on Ruane that when his career led him into politics, he was determined to expand mindfulness practice into policymaking. Since then, by his own account, he has tabled hundreds of questions in U.K. Parliament about the benefits of mindfulness for every aspect of mental and physical health. He’s pitched the technique in Westminster tearooms to any MP who’d listen. And, with Conservative MP Tracey Crouch, who has publicly spoken about how mindfulness helped her wean off anti-depressants, he set up the All-Party Parliamentary Group on Mindfulness to serve as a kind of think-tank and propaganda machine for the use of mindfulness as a way to address a host of mental and physical health issues. The group’s first report is targeted for release in October. Ruane says it will include multiple studies and personal stories that demonstrate the technique’s benefit in multiple settings – from schools to prisons to the National Health Service. But because he and Crouch recognized from their own mindfulness practices that experience is more persuasive than any number of statistics and studies, they also decided to offer mindfulness training sessions for MPs and their staff. When it came to actually setting up the courses, well, if you want to rope in experts, it’s handy to be an MP. 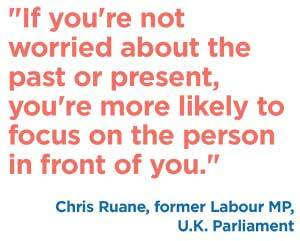 Ruane turned to Baron Layard of Highgate, a Labour peer who’s also an adviser to the Oxford Mindfulness Centre. With Layard’s assistance, Ruane landed Mark Williams, the Oxford psychology professor who helped get mindfulness accepted by the National Health Service – and, says Ruane, probably the best mindfulness teacher in the country. He convinced Williams to lead the first course. So far, 115 MPs have taken that course. Parliamentary staffers are also eager participants. When they were recently invited to fill vacancies, 22 applied in the first two minutes. And interest continues to build. MPs started signing up for the next course, which starts in October, back in August. But for all the enthusiasm in U.K. Parliament, the notion of governments (and for that matter, corporations) promoting what is, at least in its origins, a Buddhist form of prayer, makes a lot of people twitchy. In fact, its growing trendiness makes even some of its proponents uneasy. In a 2013 blog post title “Not a Productivity Tool,” Kenneth Folk, a prominent San Francisco mindfulness teacher, took a cynical view of the technique’s popularity. Mindfulness popularizers tend to tiptoe lightly around the technique’s religious roots, presenting it as an entirely secular and practical exercise that will improve a practitioner’s wellbeing and effectiveness. But when governments, which are by nature no more benign than corporations, start pushing mindfulness as a way of becoming more effective, the question does spring to mind: Effective at what, precisely? In an article late last year that appeared in The Spectator, a British conservative magazine, UK journalist Melanie McDonagh challenged the technique’s emphasis on non-judgmentalism. “There are some things about ourselves and our situation,” she wrote, “which we jolly well shouldn’t be non-judgmental about, which we should be trying to change.” Some MPs jokingly refer to the mindfulness group in the House of Commons as a cult. The Mindfulness Initiative, run by Jamie Bristow, still works closely with the parliamentary group. Bristow argues that by teaching practitioners to be less judgmental, mindfulness teaches them to be kinder. When they accept what’s going on inside and outside of them, he says, “they’re not going on to the fight or flight response. With mindfulness, you have an increased amount of space between awareness of a thought and action.” One researcher, he says, found people who had been trained in mindfulness were roughly three times as likely to help a stranger in need than those who hadn’t. That ability not to act on emotions immediately can be especially helpful in politics, he says, because of the different understandings of human nature that almost universally underlie left- and right-wing political perspectives. Grossly simplified, leftwing thinkers see human beings as a blank slate twisted by society while rightwing thinkers emphasize personal responsibility. “On both sides, those theories have big flaws,” he explains. “When you start to chip away at them you come to something closer to truth.” Anything that helps politicians move in that direction, he argues – whether it’s mindfulness or some other form of reflection – can only help the political process. And Tracey Crouch has pointed out another benefit that might attract politicians. The mindfulness sessions have helped her give much better speeches. Ruane has no doubts at all about the benefits of a deep governmental involvement in mindfulness. He points out that it’s already happening, on an executive level, in many different countries. The UK’s National Institute for Health and Care Excellence, for instance, has approved mindfulness-based cognitive therapy for depression (though it warns against routinely recommending it as treatment for social anxiety). Its use is growing particularly fast in military and military-like settings. The Canadian Mounties offer mindfulness training, as do many prison systems and the U.S. Marine Corps. Its enthusiastic adoption by the military troubles some teachers, who are deeply embedded in the Buddhist pacifist tradition, Bristow says. “But if a young man of 18 is 4,000 miles from home, deeply homesick, highly stressed and confused and has a gun – would you teach him mindfulness?” Any training that allows him to make better decisions under pressure can only be a good thing, he argues. That’s why, now that Parliament is no longer claiming his time, Ruane is on a campaign to get mindfulness on the agenda in other national legislatures. He has already met with legislators from Germany and from the Netherlands, and is soon going to Australia to meet with legislators there. He points gleefully to U.S. Congressman Chris Ryan (dubbed Congressman Moonbeam by The Atlantic magazine), who has set up weekly meditation sessions for congressional staffers that usually draw 20 to 40 participants, as well as separate sessions open only to members of Congress.